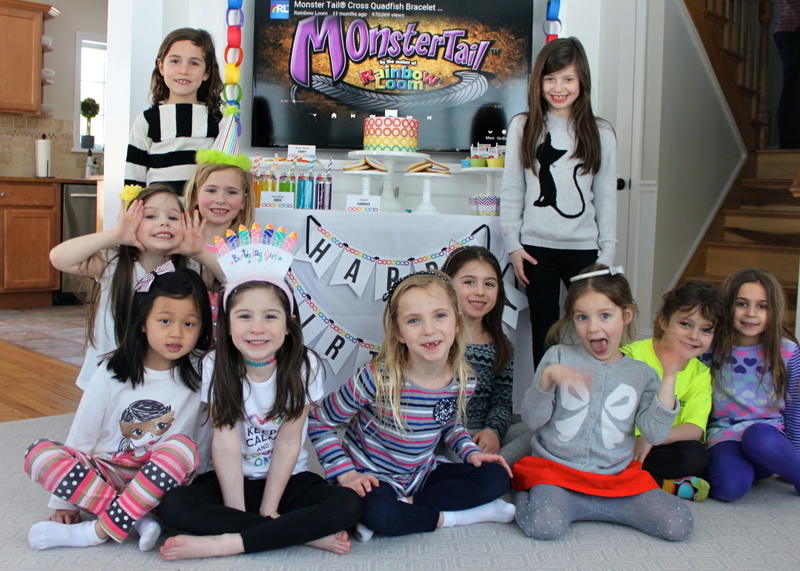 She had a Teddy Bear Picnic for her sixth birthday to celebrate her love of stuffies, so this year she asked for a RAINBOW LOOM birthday party. 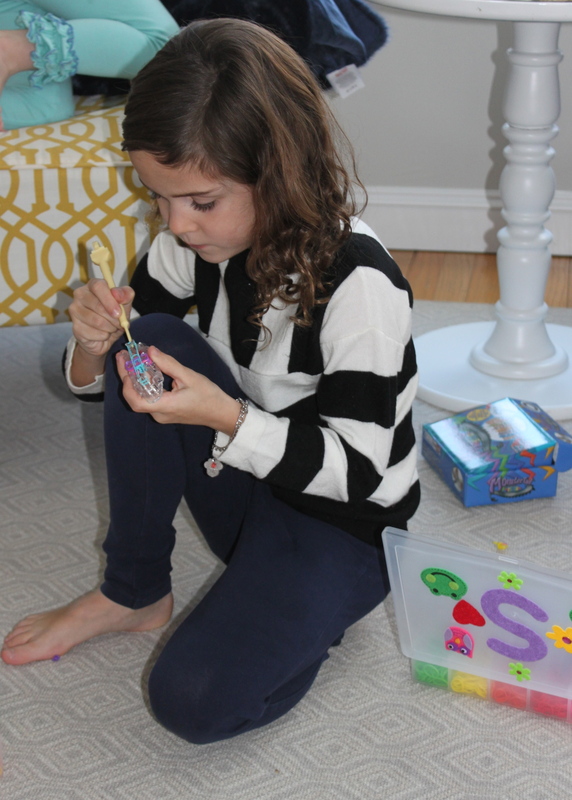 For those of you who don’t know, Rainbow Loom is a plastic loom used to weave colorful rubber bands into bracelets and charms. 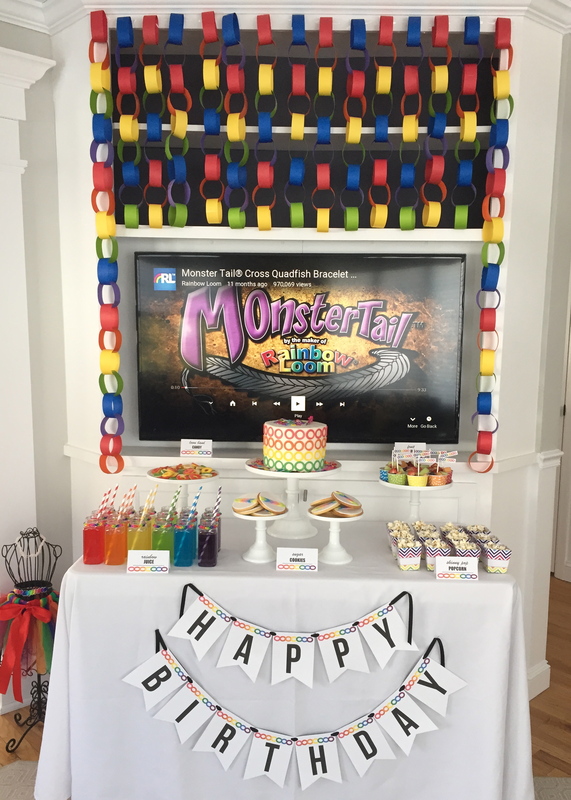 For this party, we went with all the colors of the RAINBOW in the decor. All of the decorations were DIY and super easy to make. 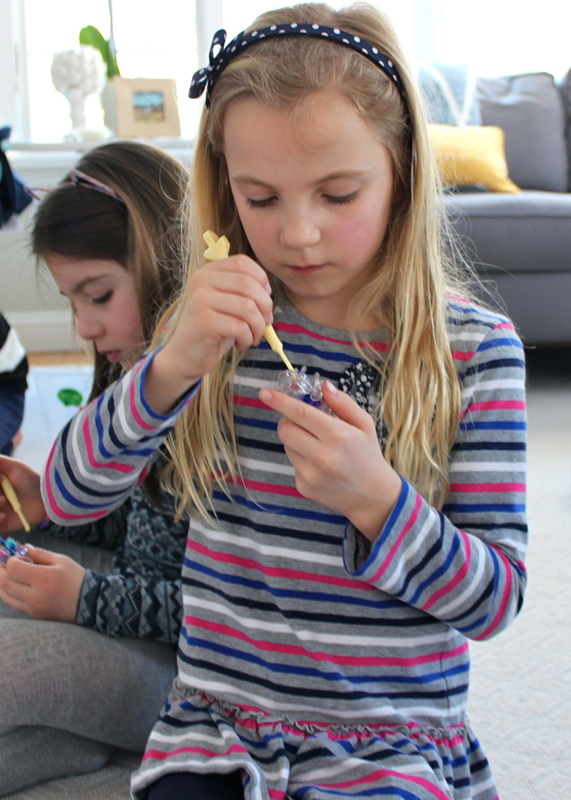 I enlisted the kids to help with much of it and they really liked getting to craft with me. The cake table was once again the focal point of the party. We decided to go old school and link together strips of colored paper. Do you remember doing this as a kid? The kids loved making these! 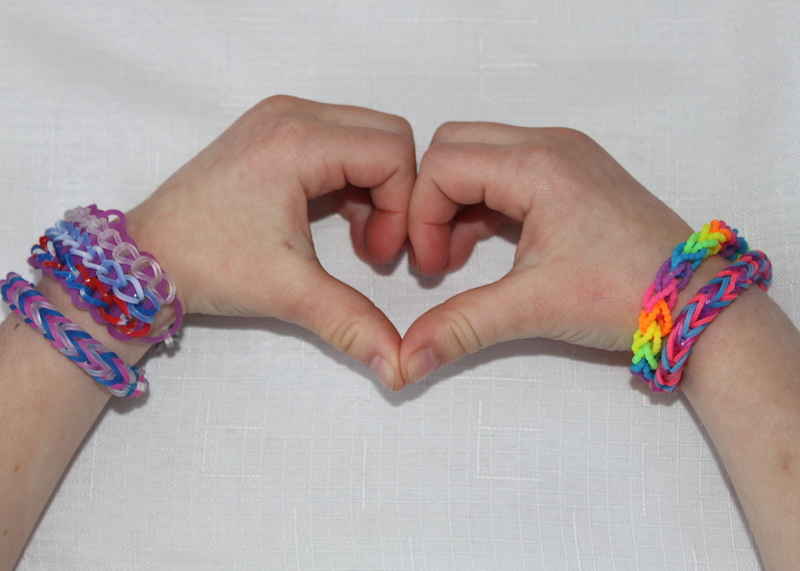 I love that they totally resemble the Single Rainbow Loom bracelets! 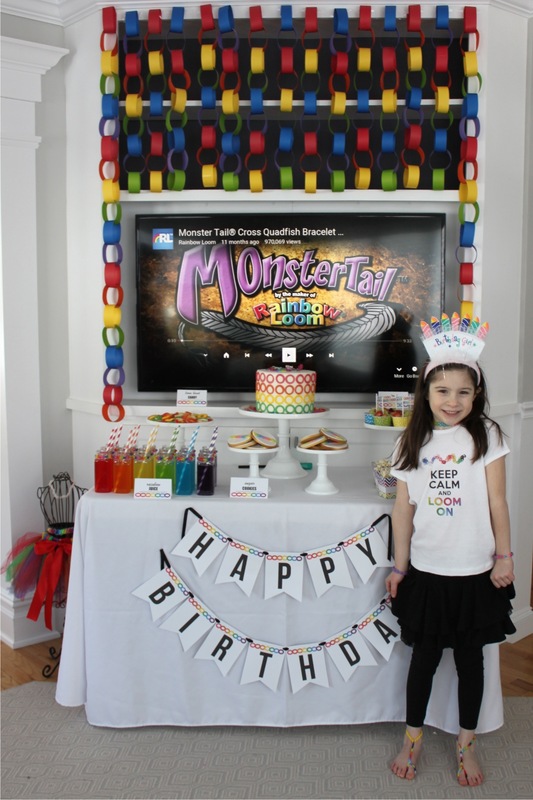 I usually cover the TV with decorated foam board, but this time I put a video tutorial on pause and used the intro image as the the backdrop. 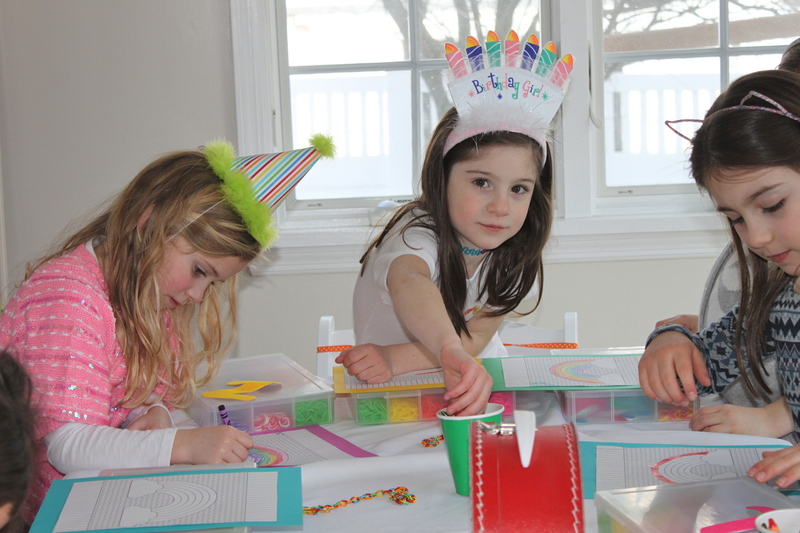 Later in the party we played the tutorial so the guests could learn how to make a bracelet. For the table, I used a simple white table cloth. I got a great deal on these on Amazon. They don’t wrinkle and they are easy to clean. They are just the best! And cheap too! 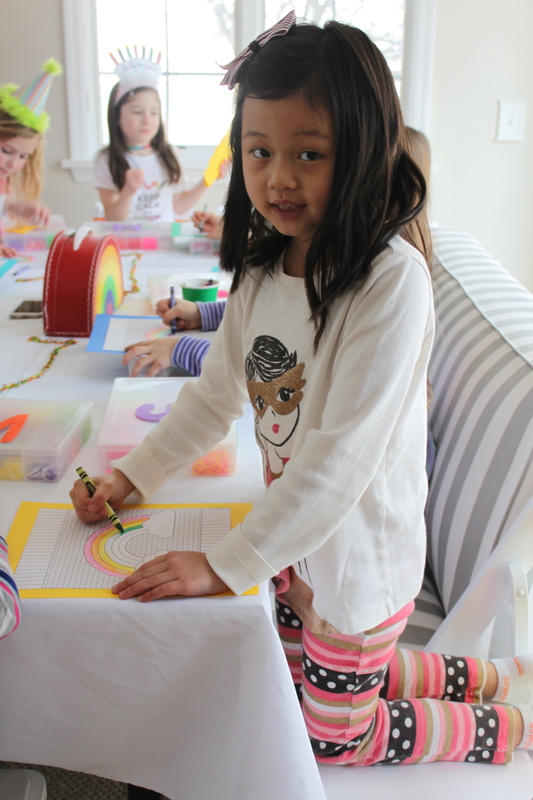 For the banner on the front of the table, I used a simple colorful circle design along the top of each flag to resemble the tiny loom bands I find all over my house. 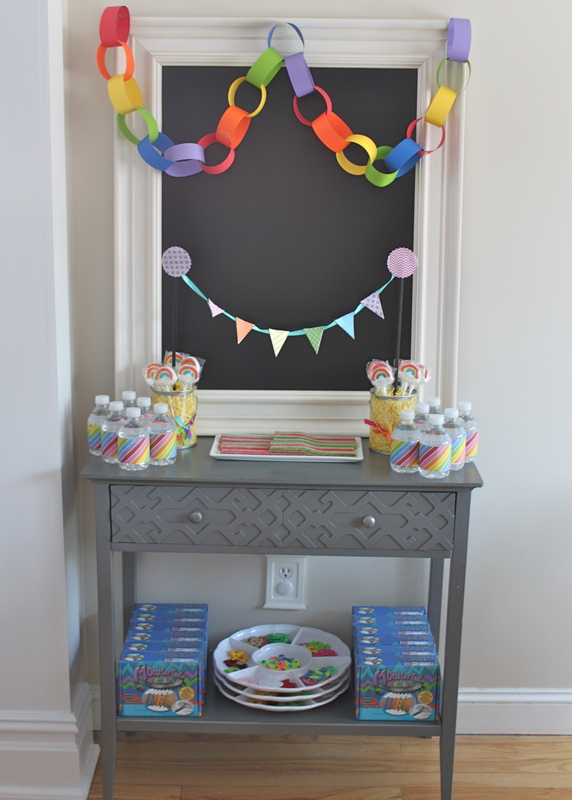 The cake table featured “Rainbow Juice” also known as GATORADE in all the colors of the rainbow. I poured the Gatorade into these French Square Plastic Bottles from the TomKat Studio. Morgan and Madison made the bracelets that adorned the top of the bottles. This was another DIY made by kids that made a nice impression and served as a small gift for the guests. 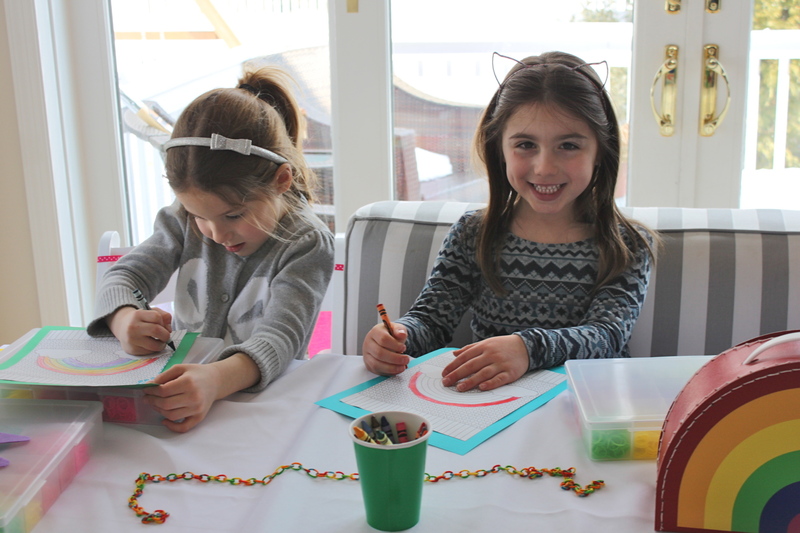 Also featured on the table was “Loom Band” candy which was simply gummy ring shaped candy. The sugar cookies were made by my wonderful cookie mama, Carrie Budke of AngelCakes in Rye, NY. 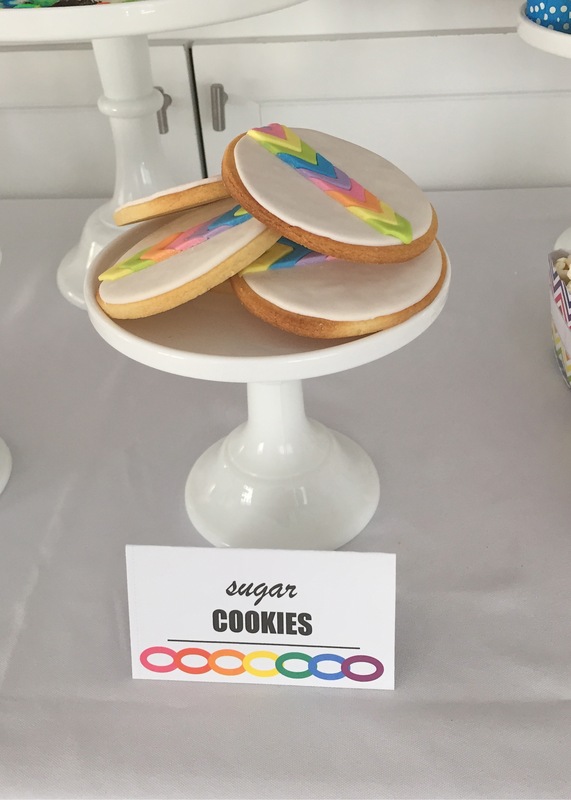 The simple chevron design on top of the cookies really popped against the white background and looked a lot like the Fishtail Rainbow Loom bracelets. 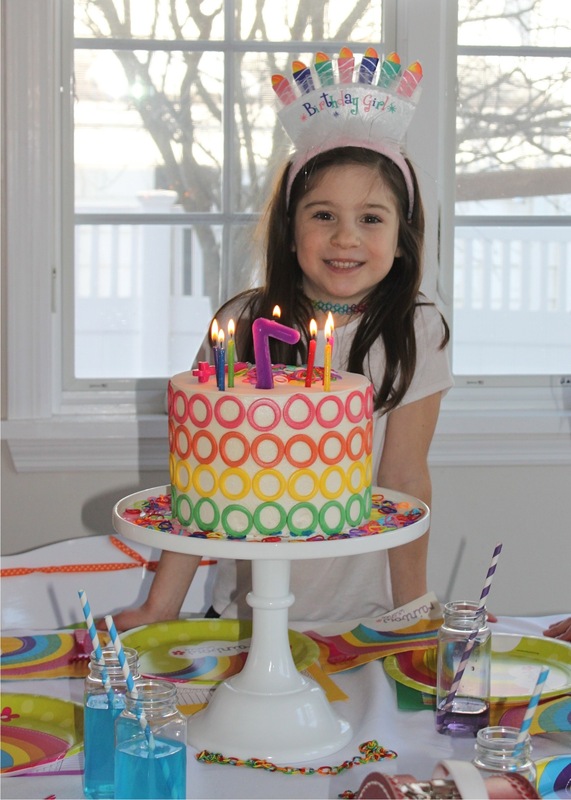 The cake was from Cerbone’s Bakery in Rye Brook, NY. 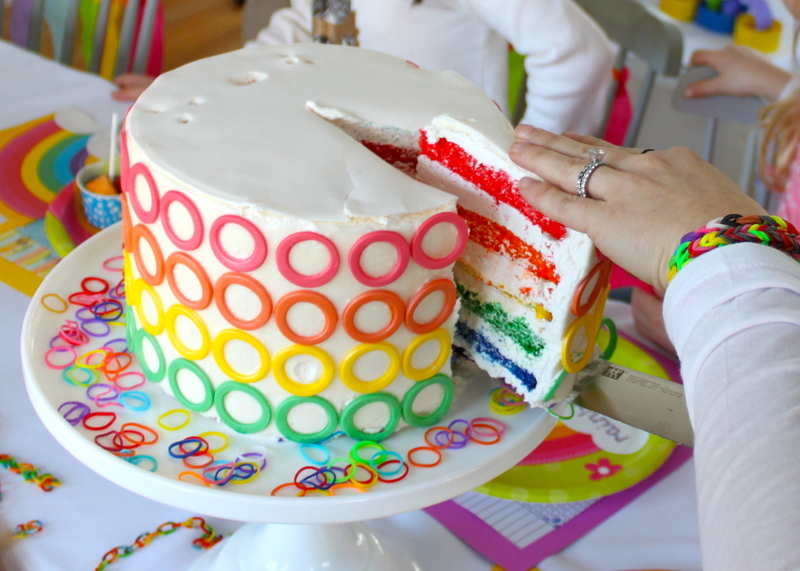 They decorated the outside of the cake with colorful circles to resemble the loom bands. 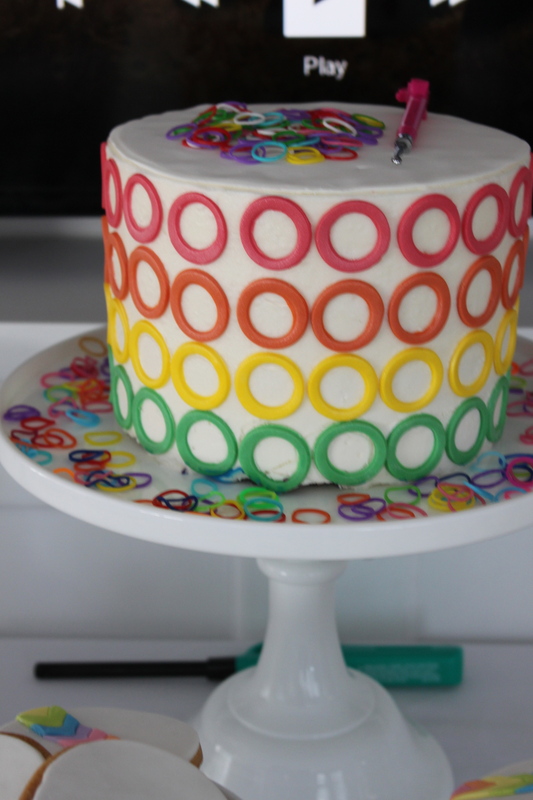 I asked them to make a plain white fondant circle for the top so I could decorate it with real loom bands and one of Morgan’s loom hooks. To keep it a little on the healthy side, I made fruit cups with fruit in all colors of the rainbow and filled Chevron Rainbow Candy Cups with Skinny Pop Popcorn. 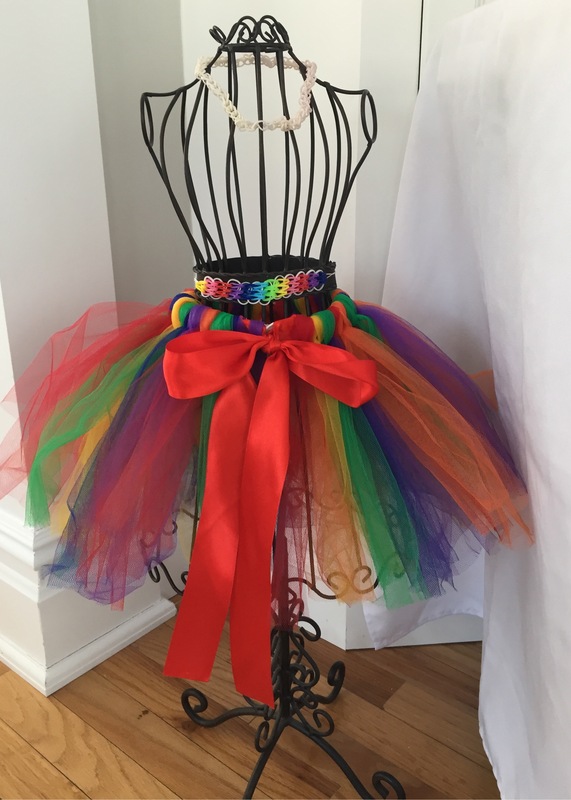 Another cute touch was the dress form that I dressed with a rainbow tutu (tutu last seen here, dress form last seen here) and a rainbow loom belt and necklace that Morgan made. 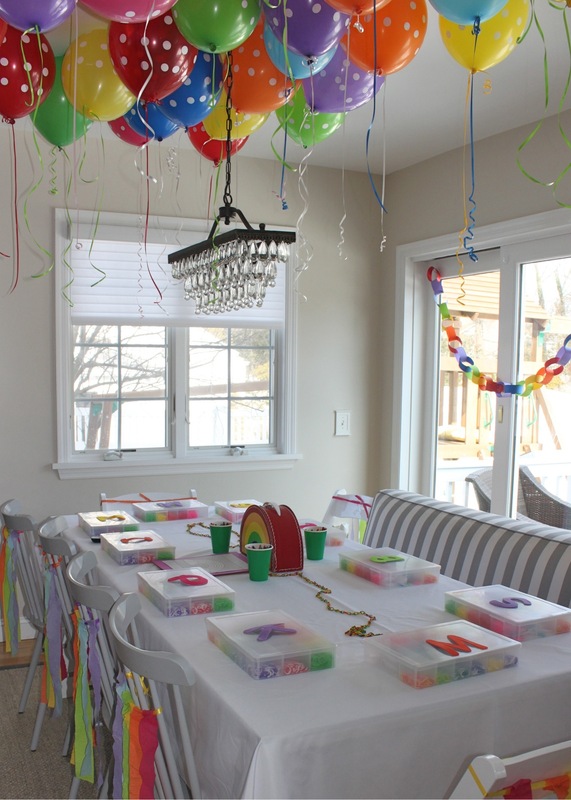 In my dining area, I placed a bunch of colorful balloons above the table and a long chain of colored paper links on the sliding doors. The long chain made a pretty backdrop for the table and the balloons always bring lots of drama and color to the space. I kept the table decorations simple just using a small rainbow suitcase found on Amazon as a centerpiece and strands of rainbow chains from Oriental Trading that I spread down the middle of the table as a runner of sorts. 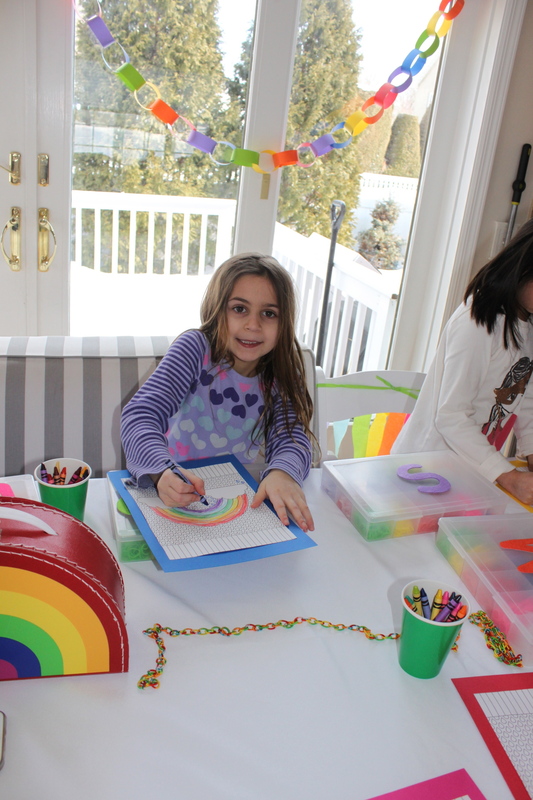 I also recycled the rainbow streamers on the chairs from Madison’s Arts and Crafts party a few years back. 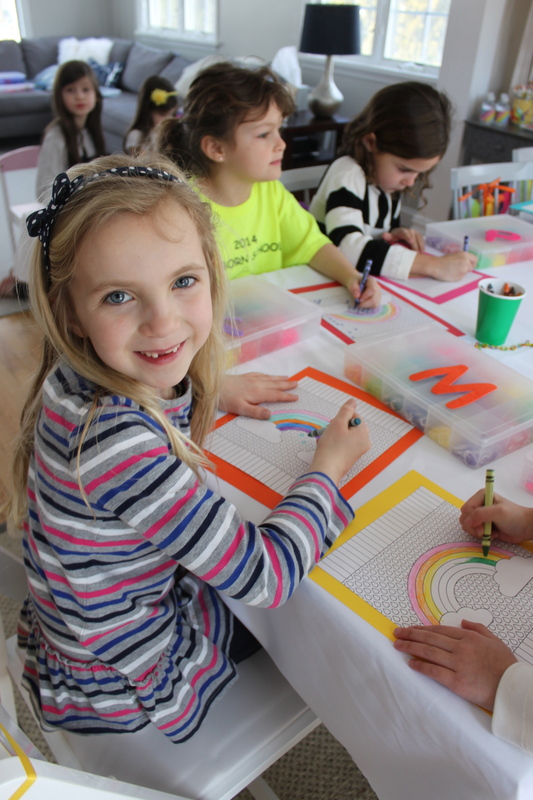 Each place setting had a divided organizer full of Rainbow Loom rubber bands and a large foam letter sticker sitting on top. 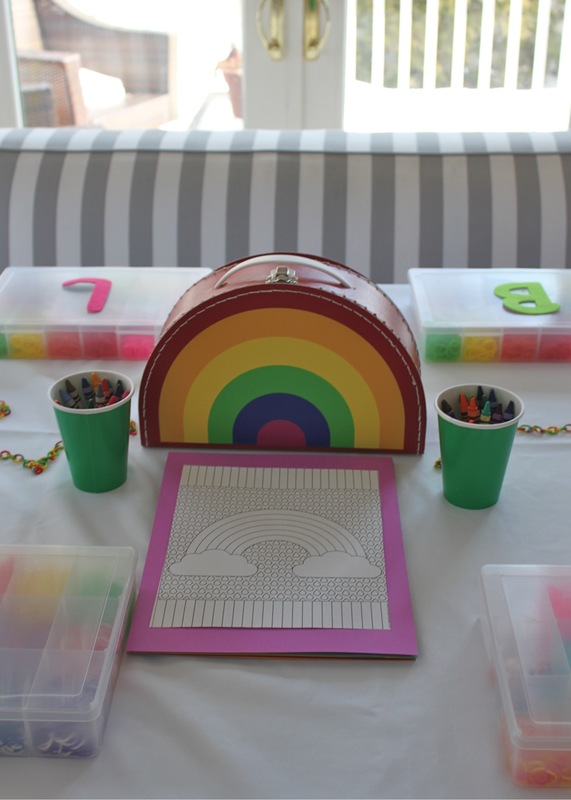 The guests found their initial and started coloring a rainbow coloring page while waiting for everyone to arrive. 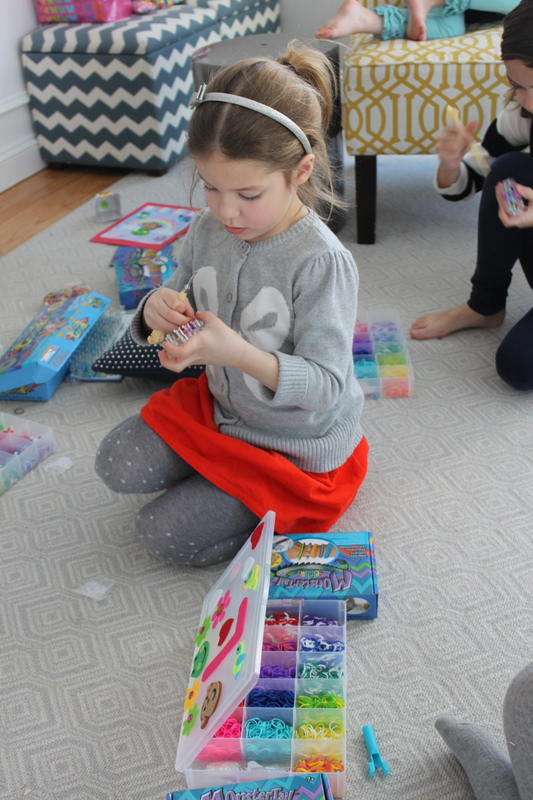 After coloring, I brought out a bunch of foam and felt stickers and the kids went to town decorating and personalizing their new Rainbow Loom Band Organizers. 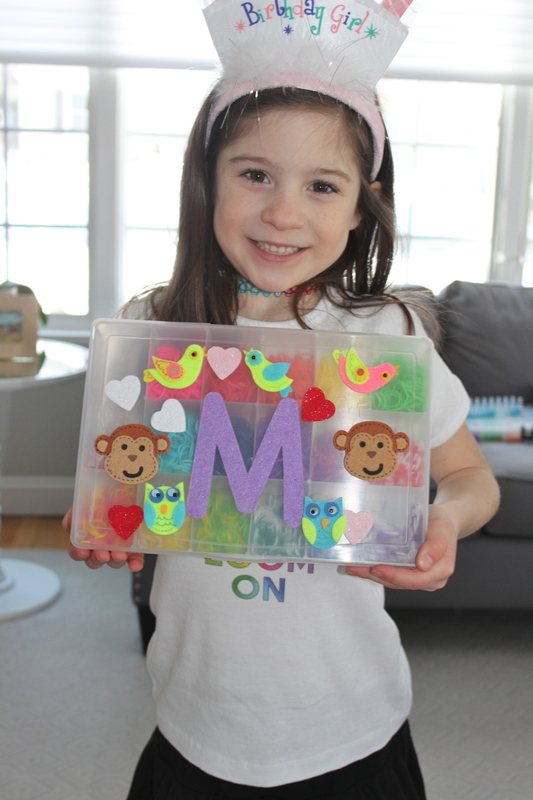 This was great because it not only served as the craft for the party, but also part of the party favor! 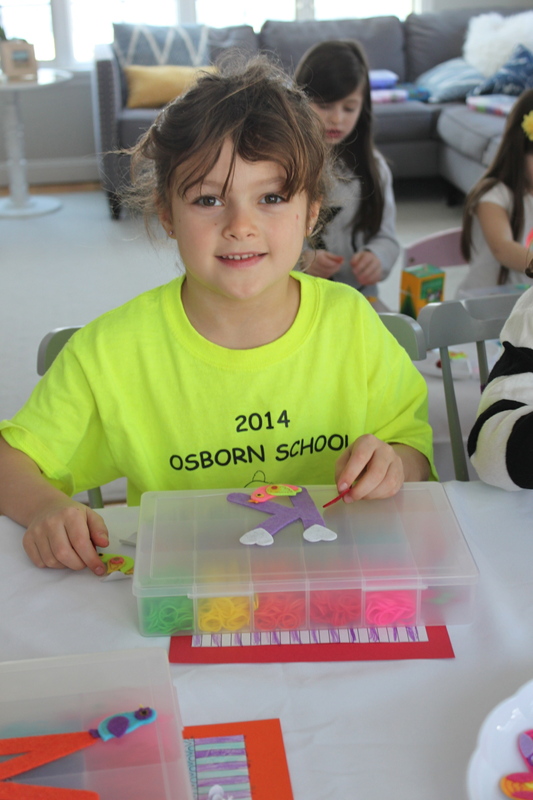 In addition to the organizers, they also got a Monster Tail which is the new travel loom made by Rainbow Loom. 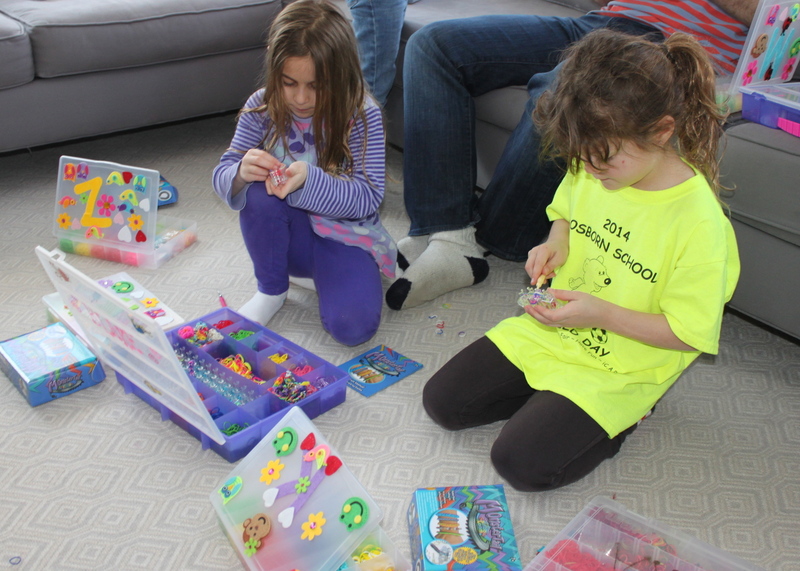 After decorating the kits we headed to the living room floor and opened up the new Monster Tail kits. 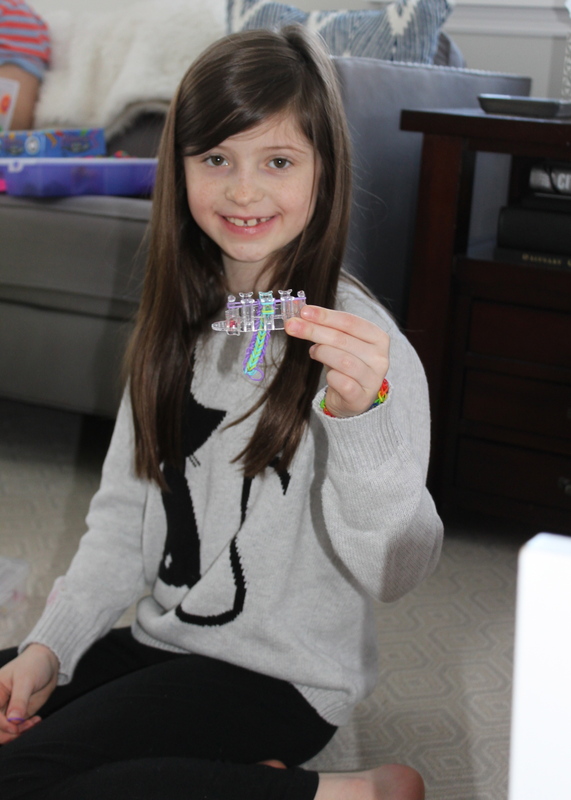 I played a tutorial I found on YouTube which taught the girls how to make their first bracelet using the new Monster Tail Loom. 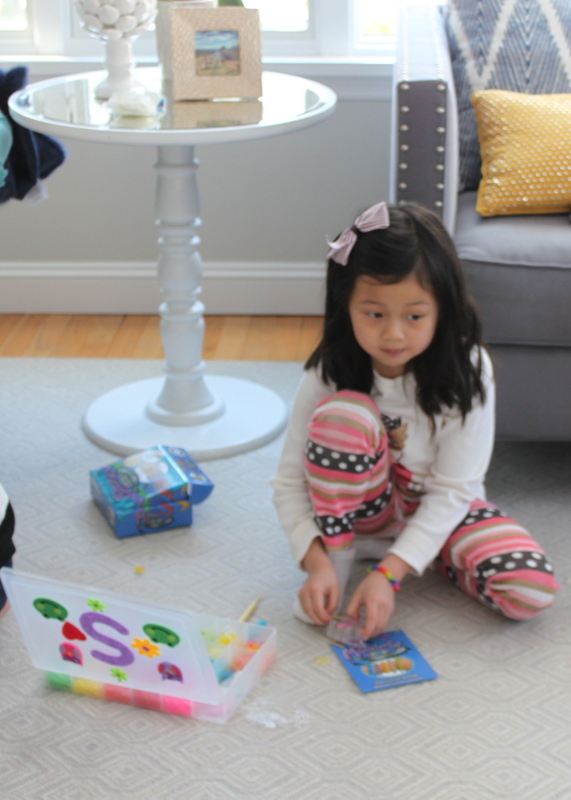 Full Disclosure: It was a little difficult helping twelve girls loom for the first time! If I had it to do again I would have enlisted the help of a few older girls. 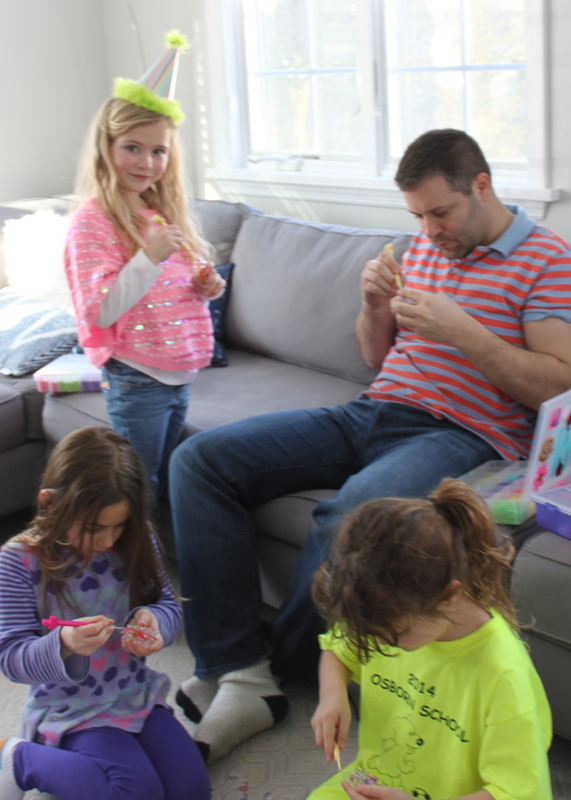 Here is my husband getting his loom on! So thankful he was able to help! My 8 year old was a big help too! 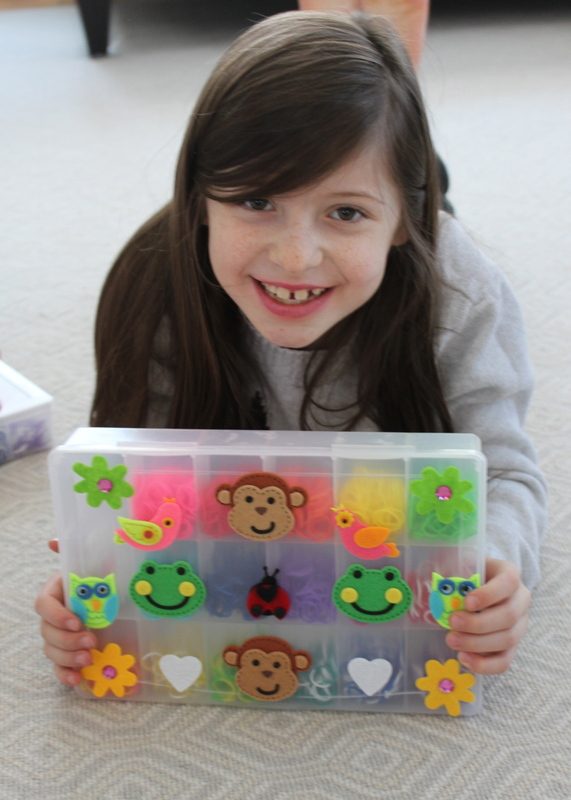 She picked up the pattern really quickly and was able to help teach some of the younger girls who were new to looming. 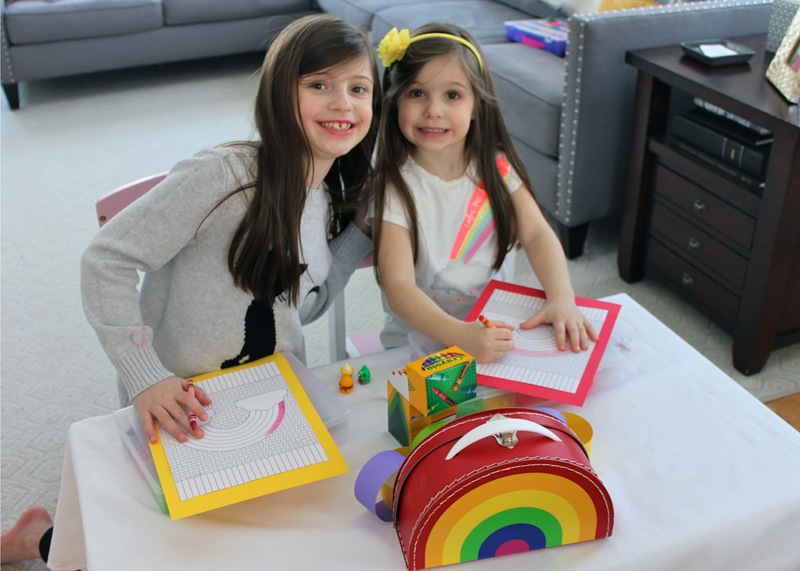 The girls did a great job giving it a go and I hope they are having fun with their Monster Loom and new loom band organizer kits at home. 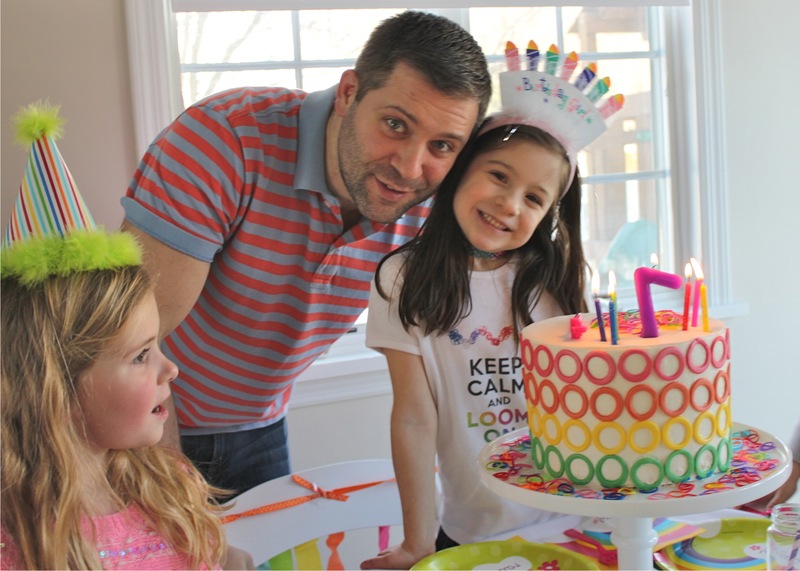 After making bracelets (or trying to at least), we sang Happy Birthday and had cake and treats. 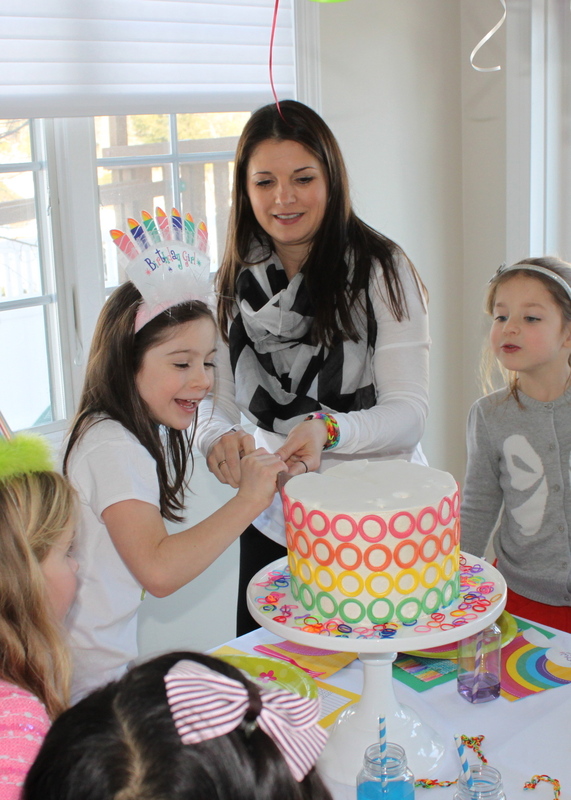 Morgan was so surprised to see the inside of the cake as we cut into it! This was by far my easiest party to plan and throw. 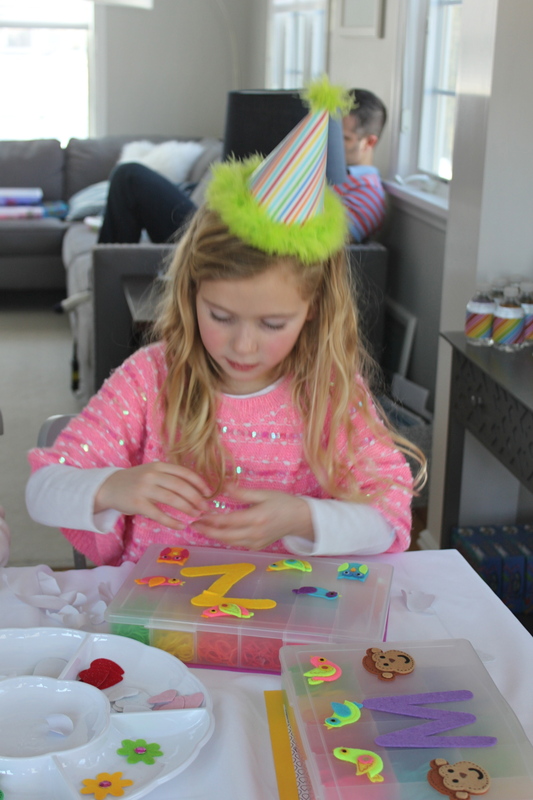 I loved that the decorations were simple DIY projects that the kids could help with. 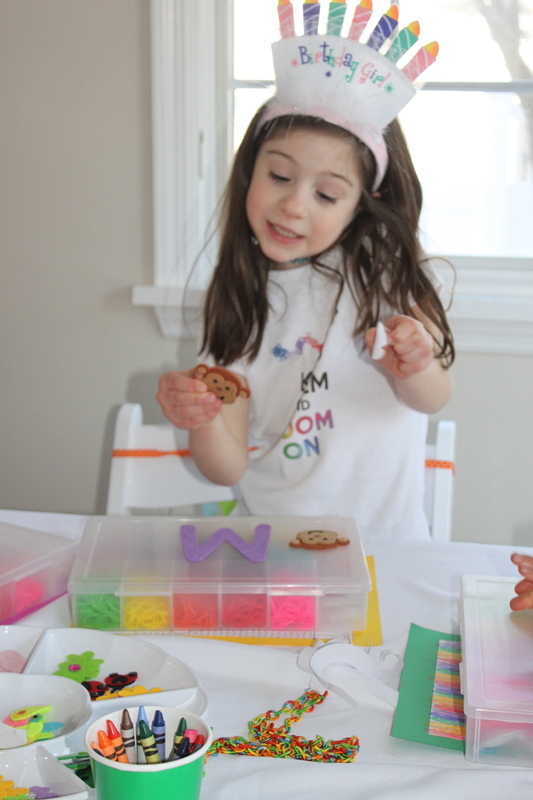 I also loved that I was able to incorporate the favors into the craft and main party activity. 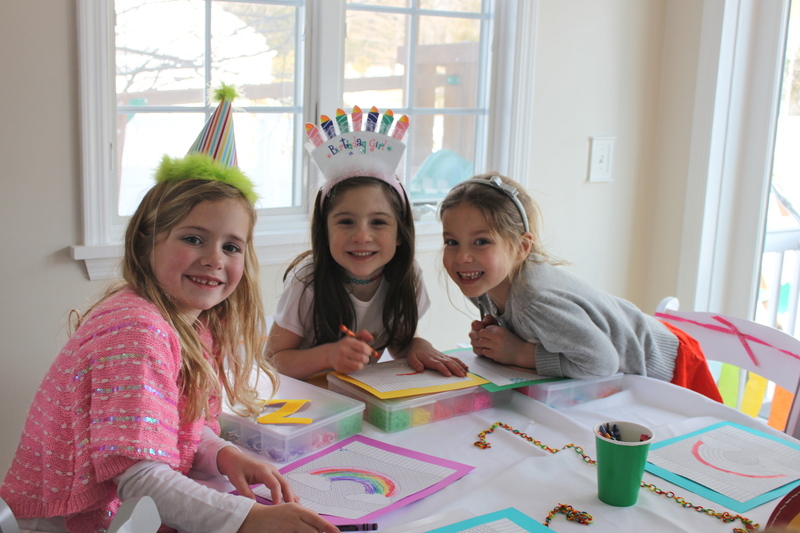 It went really well and Morgan finally got to loom with her friends- something she has been wanting to do for quite some time. 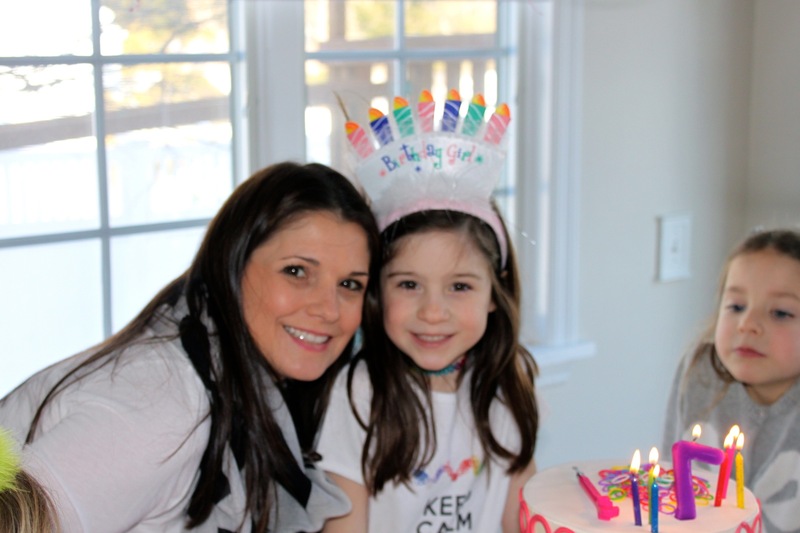 I leave you with a few more pics and a happy birthday wish for my sweet 7 year old, Morgan. I hope your birthday was all you wanted it to be. 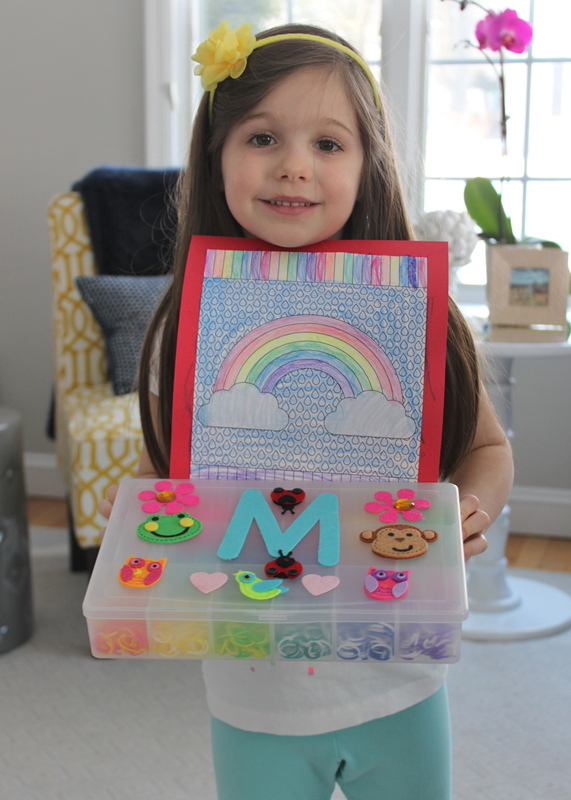 Keep being crafty and creative! Never let anyone dull your sparkle! Amazing and creative with surprises at every turn! Very cool party. Love it! Another great job! Every party you do amazes me! !